Located on the French coast of the Mediterranean Sea, the French Riviera (Côte d'Azur) has the glitz and glamour rivaled by few places on earth. Although the Riviera is famous for the glamour of St. Tropez, Monaco or the Cannes Film Festival, there are many other less well known attractions, such as the perched villages of Eze and Gourdon, the perfumeries of Grasse and the glass blowers of Biot, the potters in Vallauris. The Riviera has been the inspiration for many well-known artists such as Picasso and many of their works are on display in local museums and art galleries. 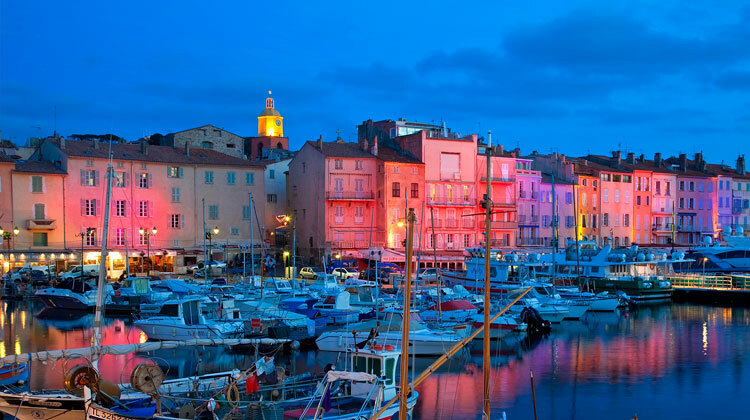 Lying to the west of Antibes, Cannes is the other main city of the French Riviera: Cannes is of course most famous for its annual Film Festival, which after the Hollywood Oscars ceremony is the biggest annual event in the world of film. Cannes is also a popular venue for trade fairs, including the annual music industry fair, the Midem, that takes place in late January. During these events, the town attracts visitors hoping to get a glimpse of their favourite film-star or musician; and of course, it is a town with plenty of tourist accommodation and beaches. Anyone thinking of visiting Cannes at the time of a major event should book their accommodation months in advance. A few miles inland from Cannes lies the small town of Grasse, capital of the French perfume industry. The famous Fragonard perfumery offers free guided factory visits and perfume museum visits. Saint Tropez, an old Mediterranean seaport standing on the south shore of a very sheltered bay, the Gulf of Saint Tropez, has long been a classically chic Mediterranean resort, frequented by stars and Parisians. With its old port and its historic centre, it remains popular to this day with jet-setters, and offers an idyllic holiday environment with plenty of shops, hotels, beaches, cafés and restaurants.